In a world obsessed with speed, shortcuts and instant gratification, Chivas Regal has decided to slow things down. The brand recently launched a whisky pouring machine engineered from original, upcycled parts found in its Strathisla distillery. What’s wrong with pouring out a dram of whisky by hand, you might think. And to be fair, that’s my preferred method as well. The machine, however, was not designed to replace the human touch. Rather, Chivas Regal wanted to drive home the point that some things in life cannot, and should not, be simplified. The Rube Goldberg machine certainly drove home the point. After all, Rube Goldberg machines are designed to perform simple tasks in an indirect, complicated and protracted manner. They’re also incredibly fun to watch in action. Named after an early 20th century American cartoonist who frequently drew such machines in his work, the first actual Rube Goldberg machine was realised in 1949 during a contest held between two engineering fraternities at Purdue University. Unfortunately, history has scrubbed bare the purpose of that first machine but if it paid proper homage to the man itself, the machine would probably be a self-operating napkin. That was the subject of Goldberg’s first ever cartoon. As for Chivas Regal’s version, its whisky pouring machine kicks into gear when a metallic ball is dropped into the copper pipe. From there, the ball is taken on an entertaining journey through a series of lifts, spiral staircases and levers, all of which work together to pour two perfect glasses of your preferred Chivas blend. Along the way, you’ll recognise the different steps of the whisky making process. From the fermentation to the blending, Chivas Regal provides the viewer with a quick study of what it takes to create the Chivas 18 whisky. Watch the machine in action below. 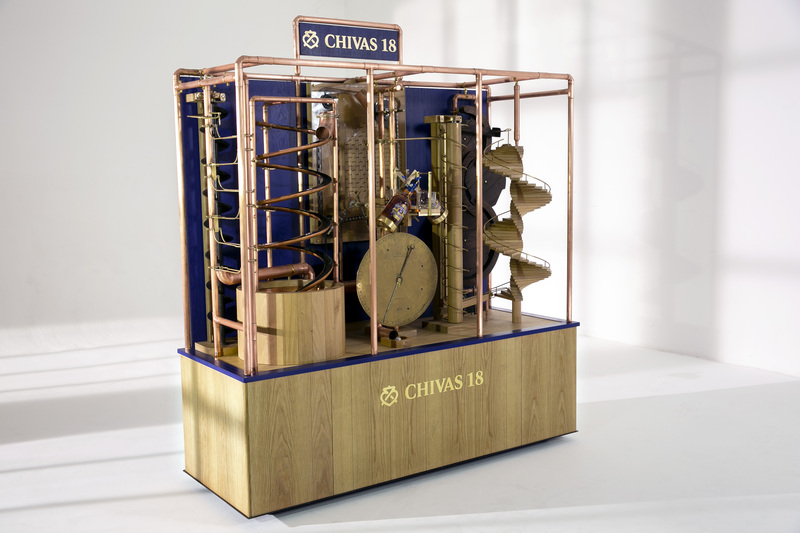 “Our elaborate machine takes 85 seconds to pour two serves of whisky – a nod to the 85 flavour notes found in every drop of Chivas 18. And that’s why I love it – it’s fun, but it also reminds us to slow down and appreciate the time, craft and skill required to create complex things in life,” explained Sandy Hyslop, the director of blending at Chivas. Eighty-five seconds might seem like a long time to enjoy a glass but when you consider that it took at least 18 years and over 20 single malts for Chivas 18 to be created, you can wait just a bit longer. We’ve worked together with Chivas Regal to let you enjoy $15 off its Chivas 18 with the promo code AUGUSTMANCR18. Purchase yours now at www.drinksandco.sg before 31 October.